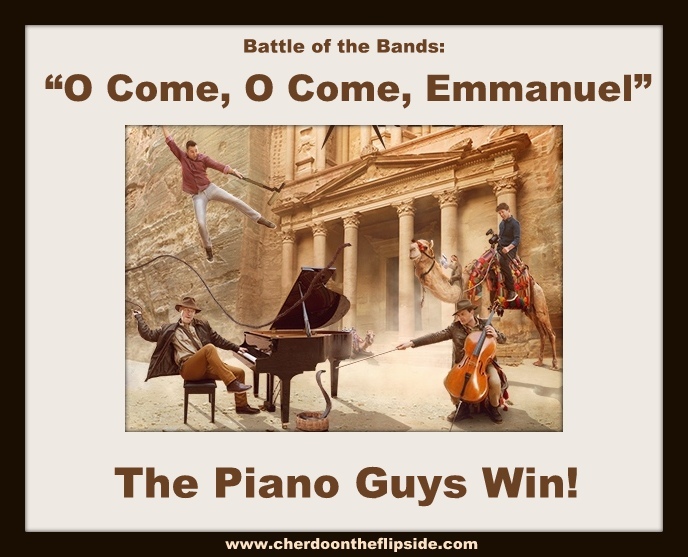 Cherdo on the Flipside: BOTB Results: "O Come, O Come, Emmanuel"
BOTB Results: "O Come, O Come, Emmanuel"
Wow, that was a great battle between The Franz Family, The Piano Guys, and Pentatonix. And I was a little surprised at the two that kept the race close: The Franz Family and the Piano Guys! Seriously, Pentatonix scared the mistletoe outta me, fearing they'd run aware with it. They're everywhere! Check out the results on everyone else's blog and spread the Christmas love while you are at it. I'll be back on the 15th of the New Year - how about you? I'm praying it will be less hectic, more peaceful, and you all will be practically bragging about how great life is treating ya! That was a good battle! Have a wonderful Christmas, Cherdo! Have a Merry and a Happy!! All right for The Piano Guys! Not a bad outcome. I preferred the Franz Family, but the Piano Guys weren't bad at all. Last month was a bit hectic and I'm just now learning how this battle went down. I believe I voted for the Piano Guys. It looks like they barely squeezed in a victory. I hope you had a lovely Christmas and I pray God's blessings will be with you throughout 2018. Be happy and well, my friend!